Apple's flaship smartphone iPhone 8 pairs with higher-resolution display, a 64-bit A11 process that runs at about 31% faster than the iPhone 7 chip and a bigger battery allowing to save more video clips and movies, all of which indicate playing HD videos on iPhone can be an exhilarating experience. The disappointing thing is that iPhone 5S or even the latest model cannot play videos more than M4V and MP4. In case you own a wealth of high definition MKV videos or other HD videos like M2TS, MTS, TS and AVCHD and want to watch them on your iPhone 5S, you will go with a hitch. Does this mean it's impossible to play MKV on iPhone 5S? Technically, if you have a sound HD video converter that supports converting MKV M2TS AVCHD to be iPhone 5S friendly, all headaches can be removed instantly. MacX Video Converter Pro is such a program that is adept in HD video conversion on macOS (High Sierra) as well as Windows (10). It can impeccably convert MKV to iPhone 5S, M2TS/MTS to iPhone 5S, AVCHD to iPhone 5S as well as iPhone 7s/7/6s/6/Plus/SE/5s, Samsung Galaxy S8/Note 8 and more with fastest speed (up to 5X faster than others), due to its use of hardware acceleration tech and top quality, so that you can import and play multi-track videos M2TS (Blu-ray), MTS, TS, AVCHD on iPhone 5S without worrying about format incompatibility. Best HD video to iPhone 5S converter to convert MKV, M2TS to iPhone 5S/8 Plus/7s/7/6s/6/SE/5s etc with world's fastest speed (5x faster) and no quality loss! Prior to video conversion on Mac, you have to download, install and run this video converter for Mac first. For Windows users, please head over to HD video converter for Windows. Step 1: Add MKV Video File. Import MKV source video by clicking "Add File" button. You can also add more than one MKV video files and convert them at one time. Choose the output format as you like. To convert MKV M2TS AVCHD to iPhone 5S on Mac, simply hit Apple Device > to iPhone Video and choose iPhone 5S as the output format etc. Or you can go Mac General Video and select iPhone 5S viewable format like MP4 or M4V as the output format. Tips: This iPhone 5S video converter for Mac features video editing, entitling you to trim a segment from MKV video, crop video from removing black bars, merges several MKV videos into a new one, add a watermark to make it personalized and plug in subtitle into the loaded MKV files. Hit the "RUN" button to start converting MKV M2TS AVCHD video to iPhone 5S on Mac OS. After a few seconds, you can sync the converted MKV video to iPhone 5S for playback anytime. 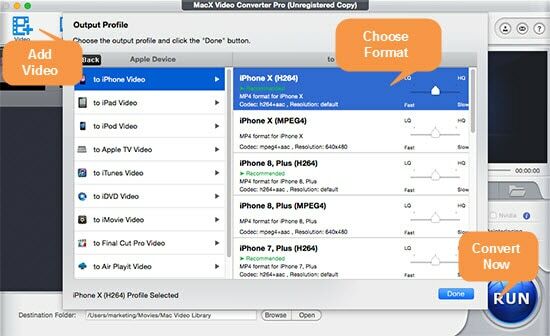 Besides, MacX Video Converter pro also permits you to download and convert HD movies to the latest iPhone 7/6S/6S Plus as well as other popular format and devices, such as converting MKV to AVI, MKV to Android phone/tablet, M2TS to WP8 mobile/tab as well as other gadgets like iPhone, iPad, Apple TV, PSP, Google New Nexus 7, Kindle Fire HD, etc. Possible iPhone 5S plays HEVC video natively on iOS 11? Not sure yet. The iOS 11 iPhone 5S/Plus/7/6s/SE theoretically can play HEVC video encoded by iOS 11 camera app. When you import HEVC video from computer to iPhone 5S/7, you might still need to convert HEVC/H265 to H264 if iTunes sends you an error message. There are tons of iPhone video converters out there, but which is the best one to convert video to iPhone comparing with input output files, fast speed, features, ease of use etc. Read this reviews article about best iPhone video converter comparisons to convert MKV M2TS FLV AVI to iPhone 5S/5/4S/4 easily. Best iPhone 7 video converter to easily convert videos to iPhone (iPhone 7s/7/6/Plus iPads Android included) in 1080P, 4K 2160P, 8K 4320P MKV, MTS, AVI etc with top quality and 83 x faster speed. Also iPhone video download in HD MP4 from 300+ sites is allowed.